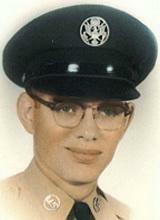 DUNKERTON - Peter E. Bernard, 70, of Dunkerton, died Sunday, Aug. 8, at Allen Hospital of natural causes. He was born Sept. 28, 1939, in Waterloo, son of Herbert and Blanche McCollough Bernard. He graduated from East Waterloo High School in 1957. Mr. Bernard served in the U.S. Air Force and received degrees in accounting from Fullerton Junior College and California State College at Fullerton. He worked for several accounting firms in California before retiring to the Waterloo area. Survived by: a sister, Kathy (George) Deloff of Cedar Falls; a brother, Jon Bernard of Waterloo; and 10 nieces and nephews. Preceded in death by: a brother, Donal Jennings. Graveside Services: 10:30 a.m. Wednesday at Waterloo Cemetery, 1830 Kimball Ave. Military honors by Offutt Air Force Base Honor Guard, Offutt Air Force Base, Nebraska. Parrott and Wood Chapel of Memories, an Overton Family Service, is in charge of arrangements.